Raytheus is an unreleased Mobile Assault Vehicle. It is the first of Dan's two Mobile Assaults. Raytheus is a high speed jet vehicle with turbo and belongs to Drago. It appeared in the preview for episode 22 and episode 23 and it looks like a motorcycle. It is owned by Dan. It's Pyrus version has 270 Gs. It's Haos version has 260 Gs. It has also been seen in Aquos, Darkus, Ventus, and Subterra. It might not have wheels, because it is cylindrical. It will be released in November/December. 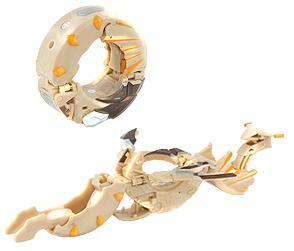 Purchase Raytheus Bakugan from Amazon now!